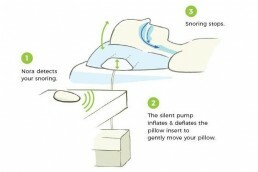 Simply slot the expander under your pillow and fall asleep. 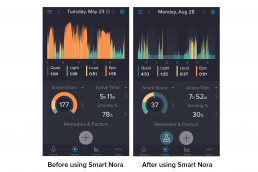 Nora’s pebble listens for your snoring throughout the night and tells the expander when to inflate – gently stimulating your airways to nip snoring in the bud! 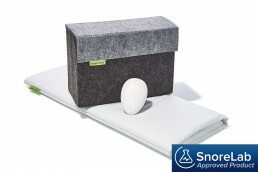 Suitable for every type of snorer – Smart Nora’s unique approach is suitable for back, front and side sleepers, mouth or nose breathers, and all ages, weights and lifestyles. 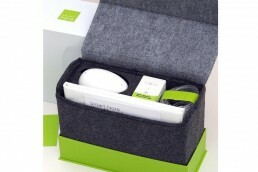 Comfortable and non-invasive – sleep comfortably and naturally with the contact-free system that uses no buckles or straps. 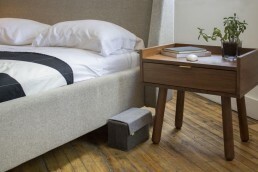 Can fit in any room with any pillow – Smart Nora’s sleek design looks at home in any bedroom and can be used with your favorite pillow without compromising performance.